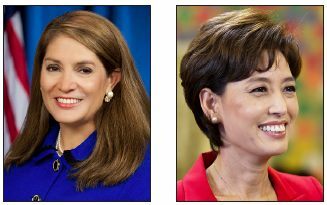 Former Assemblymember Sharon Quirk-Silva, a Democrat, has defeated the Republican incumbent who unseated her two years ago, Young Kim, in the 65th Assembly District. As of Nov. 29, results from the Nov. 8 election had Quirk-Silva in the lead with 79,429 votes (53.2 percent) to Kim’s 69,790 (46.8 percent). “Today I called Sharon Quirk-Silva to offer my congratulations on her very tough and hard fought campaign victory,” Kim said in a statement on Nov. 17. “As our area faces some serious challenges in the weeks and months ahead, I will keep Sharon Quirk-Silva in my prayers that as the new representative for 65th Assembly District she will have the knowledge and judgment to be the leader our area deserves. “The result is obviously disappointing and not what we wanted. However, we leave this campaign with comfort knowing that we engaged voters through a grassroots campaign. The strength of my campaign was the hundreds of dedicated volunteers that sacrificed their personal time to be a part of our effort. Kim, the first Korean American elected to represent Orange County in the Assembly, has worked as a small businesswoman, financial analyst/controller, television talk show host, and director of community relations an Asian affairs for Rep. Ed Royce (R-Brea). Her Assembly committee assignments were Jobs, Economic Development and the Economy (vice chair), Banking and Finance, Budget, Education, and Transportation. Her endorsers included several Orange County officials: District Attorney Tony Rackauckas, Sheriff Sandra Hutchens, Supervisors Andrew Do, Michelle Steel, Shawn Nelson, Todd Spitzer and Lisa Bartlett, Clerk-Recorder Hugh Nguyen, Assessor Claude Parish, Auditor-Controller Eric Woolery, and Board of Education members Linda Lindholm, Ken Williams and Robert Hammond. Other supporters included former Gov. Pete Wilson, Los Angeles County Supervisors Don Knabe and Mike Antonovich, Westminster Mayor Tri Ta and Councilmembers Tyler Diep and Andy Quach, Yorba Linda Mayor Pro Tem Peggy Huang, Los Alamitos Councilmember Warren Kusumoto, La Palma Councilmember Peter Kim and former Mayor Charle Hatakeyama, Fountain Valley Mayor Michael Vo, and Cerritos Councilmember Carol Chen. The district covers Buena Park, Cypress, Fullerton, La Palma, Stanton, and parts of Anaheim and Garden Grove. Both parties and special-interest groups spent large sums on the two candidates — $4.2 million for Quirk-Silva and $3.3 million for Kim, according to The Orange County Register — as the outcome would help the Democrats achieve a supermajority in the Legislature. The pivotal race now is between Republican Assemblymember Ling Ling Chang and Democrat Josh Newman in the 29th Senate District. As of Nov. 28, Newman had 157,005 votes (50.3 percent) and Chang had 155,239 (49.7 percent).